A card stacked with intriguing match-ups awaits at UFC 235 on Saturday as light-heavyweight champion Jon Jones defends his belt against Anthony Smith. In the co-main event, Tyron Woodley puts his welterweight crown on the line against Nigeria's Kamaru Usman. Meanwhile, Ben Askren makes his UFC debut and Polyana Viana fights for the first time since beating up a man who tried to steal her phone in January. 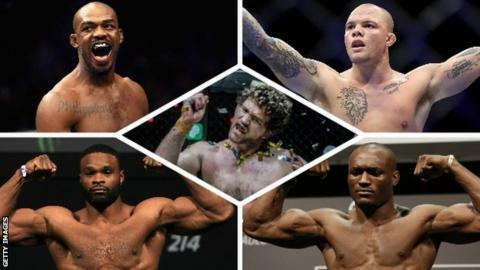 BBC Sport has a look at what to keep an eye on in Las Vegas this weekend. Brazilian strawweight Viana returns to the octagon against American Hannah Cifers for the first time since a decision defeat by JJ Aldrich at UFC 227 in August. She hit the headlines this year when a thief approached and threatened to take her phone while she was waiting outside her Rio de Janeiro apartment. Viana, 26, took matters into her own hands, knocking the man down and keeping him immobilised until the police arrived. "He said, 'Give me the phone. Don't try to react, because I'm armed'," Viana told MMA Junkie. "Then he put his hand over [a gun], but I realised it was too soft. American Jones wasn't intent on hanging around after he returned from a 17-month lay-off to finish Alexander Gustafsson and claim the vacant light-heavyweight title in late December. This is the 31-year-old's quickest fight turnaround since 2011 and will be the first time he has defended a belt since 2015 - even though he has never lost a championship bout. In Smith, Jones faces an opponent who has had to persevere to earn his shot at the title. The 30-year-old Texan made his UFC debut in 2013 on the back of 26 fights in other organisations, but was cut following his loss to Antonio Braga Neto. A run of seven wins saw Smith reclaim his UFC spot and he has since won seven of his past nine contests - it means Saturday's fight against Jones will be his 45th professional bout. Askren's UFC debut has been a long time coming. The 34-year-old is unbeaten in his professional mixed martial arts career, but enters the sport's top promotion for the first time on Saturday when he takes on former UFC welterweight champion Robbie Lawler. American Askren, who competed as a wrestler at the 2008 Olympics before turning to MMA, is regarded as one of the world's top welterweights, but a feud with UFC president Dana White threatened to stop him joining the promotion. Askren is best friends with Woodley and the pair will fight on the same card for the first time in more than a decade. A first African UFC champion? Usman was born in Nigeria, but left Benin City for Arlington in Texas at the age of eight when his family immigrated to the United States. Twenty-three years later, Usman will get his shot at a UFC title when he faces Woodley at the T-Mobile Arena. Usman is on a 13-fight winning streak and has been victorious in all nine of his UFC bouts, but faces an opponent in 36-year-old Woodley who has not been beaten in nearly five years. Should Usman, a former winner of the Ultimate Fighter TV show, triumph in Las Vegas he will become the first African fighter to hold a UFC title. Well, Stephens takes to the octagon to face Russian Zabit Magomedsharipov having earned the respect of most of his fellow fighters for talking openly about battling suicidal thoughts. The featherweight told ESPN that he considered taking his life after his first-round knockout by former champion Jose Aldo in July. "I was ready to leave my wife, leave my kids and just leave it all. Thinking suicidal thoughts," he said. Stephens, 32, credits coach Eric del Fierro for advising him to attend life classes in Las Vegas to change his mindset. "People look at us as fighters and, yes, I'm probably one of the toughest dudes you'll ever meet, but I've also been down in the dumps," Stephens said. "I'm a real human being. I'm a person, I have feelings, I have emotions."